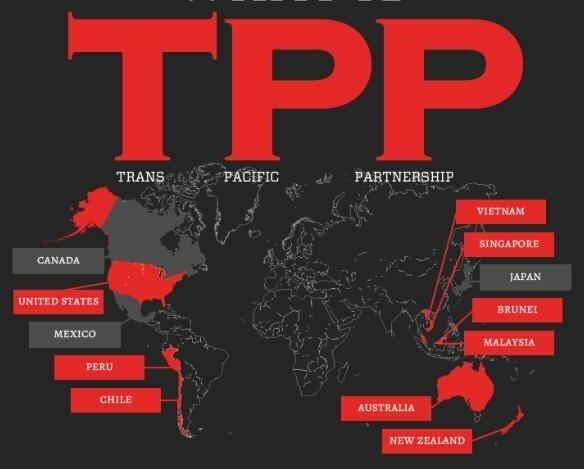 Wikileaks has obtained and posted a recent draft of the intellectual property chapter of the Trans-Pacific Partnership trade agreement. All in all, it’s pretty bad news. The Guardian covers the high points, the Electronic Frontier Foundation analyzes it in detail, Cory Doctorow has commentary on some of the more obnoxious provisions at Boing Boing, and Mike Masnick looks it over at Techdirt. The biggest thing that’s obvious right off the bat is that provisions that protect the rights of corporations and rights-holders are mandatory, while everything protecting the rights of the general public is optional. Rights-holders get “shall,” while the public gets “shall endeavor to.” Copyright is extended across the board to life-plus-70-years, period, while everyone agrees that having a “rich and accessible public domain” is nice and all and countries really ought to try to do that. In determining damages for copyright infringement, there are no exceptions permitted for works whose rightsholders cannot be found, which forecloses on any attempt to deal with the orphan works problem. It also permits seizure of any material or device used in committing copyright infringement, even if it’s something like a home computer that is used for many different purposes. There is strict protection for trade secrets accessed from computer systems, with no mandatory exception for journalism or whistleblowing. There are also a number of provisions that impose top-down control over aspects of domain name registration and disputes, and imposition of a USA-style DMCA notice-and-takedown system. We’ve noted the problem with this kind of secret treaty negotiation before. The biggest issue is that they’re a way for governments to do an end run around the need to involve public citizens in the lawmaking process. Instead of explicitly making the laws, they require participating governments to make those laws, whether the people want them or not. The negotiation process involves government agencies that are highly susceptible to content-industry lobbying, but where are the advocates for the rights of ordinary citizens? And the negotiations are always held in the dark. If it weren’t for Wikileaks, we wouldn’t be able to see what’s in the treaty at all. To quote the Guardian article, “Obama has pledged to make the TPP public but only after the legislation has passed.” What good does that do? We’re supposed to ask our representatives to vote for a pig in a poke? And by the time we find out from official sources what the treaty is supposed to do, it will be too late to stop it? The good news is, this sort of compromise invariably doesn’t play well with either party. Republicans don’t think the treaty does enough for business, while Democrats think it does too much. Hopefully that opposition will lead to trouble passing the agreement. And unlike the treaties of years past, we have the Internet now, and Wikileaks. The general public isn’t limited to just what they hear on the nightly newscasts; they can go to the source (or at least a leak of the source) and read these things for themselves, if they’re so inclined. Hopefully we’ll see some informed public opposition to this governmental push to give more of our rights away without first consulting us.